You might be familiar with PBSKids.org, but have you ever heard of The Playground? The best way I can think to describe it ~ the Australian version of PBSKids, but a part of the Australian Broadcasting Company. You may recognize a few of the shows and characters that you find on the site (Bananas in Pajamas, The Wiggles, and Jakers) but the rest were unfamiliar to me...yet so utterly fascinating to my kids..and ok, me too! The site is geared toward preschoolers ~ designed to be super-easy to navigate so that minimal adult help is needed (although knowing my little monkeys, I'm right there...because you just never know what buttons they will push!). 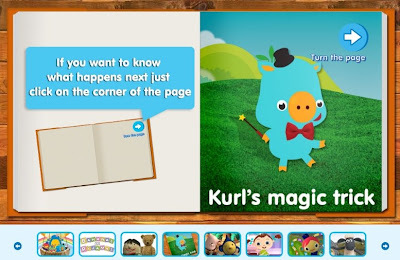 When you are on the main site, you can either choose to go into the Playground World or stay on the main page and choose from audio books and interactive board games for kids, as well as other games and activities: online printables and party packs separated by favorite characters so they are easier to find. Either page will direct you to the same activities ~ it's just up to you how you choose to get there. 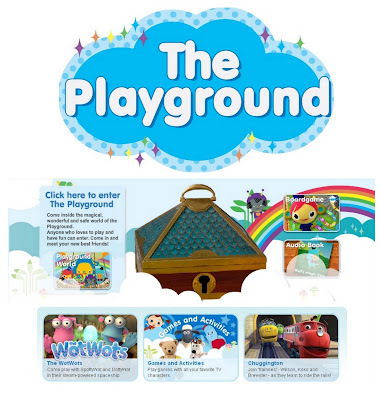 The Playground World page is just a little easier for younger kids to navigate. 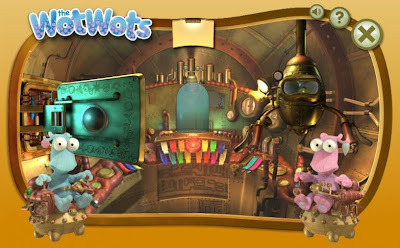 You can play with SpottyWot and DottyWot in their spaceship by making music, taking an animal quiz, mixing fruity flavors (color mixing), spend time drawing, or playing the bongo buttons (sound matching)...and more. Chuggingtown is a show about 3 little 'trainees' (oh.too.cute) and has games that help your child learn how to use specific keys on the keyboard (spacebar and arrow keys) as well as identify/match shapes. The games on the Chuggingtown area are geared a little more toward upper preschool age. They even have a little Playground Radio that will play in the background with fun songs for kids. LOVE IT! It's like an early mp3 for kids. There is plenty to click around and see (and I've had a lot of fun checking out the site myself) and only wish we had the show Chuggington's here! I am an Aussie, so not unfamiliar to me, but still a GREAT site.